Two-time world champions the Windies will be the star attraction when 10 sides converge on Zimbabwe next month for the ICC Cricket World Cup Qualifier 2018, to battle it out for the two remaining places in the ICC Cricket World Cup 2019. The announcement marks 500 days to the ICC's pinnacle 50-over tournament, which will be staged in the United Kingdom from 30 May to 15 July. Queen's Sports Club and Bulawayo Athletic Club in Bulawayo, Harare Sports Club and Old Hararians Sports Club in Harare and Kwekwe Sports Club, Kwekwe, will share 34 matches between them from 4 to 25 March, with Harare Sports Club staging the final. Hosts Zimbabwe will feature on the opening day of the tournament on 4 March when they will take on the runners-up from the Namibia tournament at the Queen's Sports Club, Bulawayo, while the Windies will square-off against the winners of the Namibia tournament on 6 March at Old Hararians Cricket Club in Harare. Zimbabwe Cricket chairman Tavengwa Mukuhlani: "We are tremendously excited to be hosting the ICC Cricket World Cup Qualifier 2018 event which will bring some of the world's most talented and gifted cricketers to our beautiful country. As the very proud hosts, we are very passionate about what we do on and off the field and we are leaving no stone unturned to ensure we deliver an extraordinarily memorable tournament. "While the ultimate goal for the teams involved will be to secure one of the two remaining berths at the ICC Cricket World Cup 2019 in England and Wales, tournaments such as the qualifier event always provide the platform for raw talent and unheralded players to emerge and this can only put the game of cricket in good stead." ICC Chief Executive David Richardson said: "This will undoubtedly be a competitive and hard fought tournament with two tickets for the ICC Cricket World Cup up for grabs as well as ODI status. Seeing four Full Member sides up against our best Associate Member teams who have progressed through qualification will make for some exciting cricket. "This is the conclusion of a four-year qualification process that began with regional events and progressed through to the global World Cricket League. There is a huge amount at stake for all ten teams battling it out for the remaining two spots at the ICC Cricket World Cup." · For the 2018 event, the Windies, Ireland, the Netherlands, Papua New Guinea and winners of the ICC World Cricket League Division 2 make up Group A, while Afghanistan, Zimbabwe, Scotland, Hong Kong and runners-up of the ICC World Cricket League Division 2 form Group B. · Each side will play the other teams in their group once with the top three from the groups progressing to the Super Six stage. · The teams each play three Super Six matches against the sides they did not meet in the group stage. All points won in the groups will be carried over to the Super Six stage apart from those gained against the bottom two from each group. 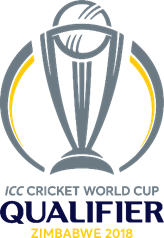 · The finalists will both progress to the ICC Cricket World Cup 2019, whilst the Netherlands (ICC World Cricket League Championship winners) and the three highest finishing associate Members will earn ODI status for the next four years till 2022.